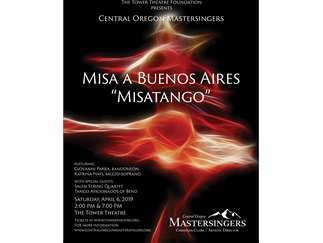 The Misa a Buenos Aires, an intense, rhythmic mass based on the tango music of Argentina, will be performed at Bend’s iconic Tower Theatre Saturday, April 6, at 2 pm and 7 pm, by the Central Oregon Mastersingers. It will feature bandoneon soloist Giovanni Parra, a two-time Latin Grammy nominee, the Salem String Quartet, and local mezzo-soprano Katrina Hays. The Misatango, as it is called, will be sung in Latin by the Mastersingers, conducted by Christian Clark. Incorporating the traditional elements of a classical choral mass, its structure is enlivened by the music of the tango as written for the classical stage. Additional tango music from Argentina also will be performed by the Mastersingers, Central Oregon’s premier choral ensemble. Parra, a two-time Latin Grammy nominee in tango and folk categories, has performed as a bandoneon soloist and with tango orchestras across the Americas and Europe. A bandoneon is a type of concertina renowned for its range and flexibility. Developed in Germany, it found its true home in Argentina, where it became the voice and soul of tango. Composer Martin Palmeri composed the Misatango in 1995/1996. He was influenced by Astor Piazzolla's “new tango,” which incorporates contemporary forms and musical developments of the tango. Mezzo-soprano Katrina Hays has performed in more than 100 productions in both regional and local repertory theaters and has appeared often with the Central Oregon Mastersingers as a concert soloist. She lives in Bend, Oregon. Mastersingers Artistic Director Christian Clark began playing piano at age 3 and singing in a choir at age 5. He holds a Bachelors of Music degree in Vocal Performance and a Masters of Music in Choral Conducting degree from Sam Houston State University in Texas. In addition to his duties with The Mastersingers, Clark is choir director at Nativity Lutheran Church in Bend and is a founding member of Bend Camerata. For additional information, please contact Laura Thompson at support@centraloregonmastersingers.com.